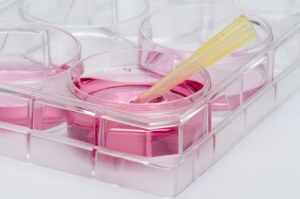 Cell culture is a technique for growing cells ex-vivo, that is to say outside their body. The goal of cell culture is to be able to observe and analyze these cells more easily. It is thus possible to test molecules on the cells in order to see what the impact of this treatment is. Tumor cells that have acquired the ability to multiply and not die because of their tumor character. 2D culture which makes it possible to cultivate the cells in the form of cellular mats, this method has many advantages such as ease of handling but they also have disadvantages such as the lack of similarity with the in vivo conditions. 3D culture is increasingly used because it allows cells to grow under conditions that mimic the cell environment in vivo. It thus makes it possible to obtain cells with a morphology close to what they have in the body.